﻿ FolkLaw Merch - CDs, Badges, TShirts and more! 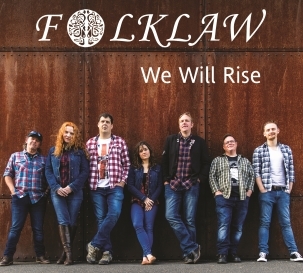 The fourth FolkLaw studio album We Will Rise released Feb 2019 with hit new songs including "Rocks of the Burren" and "We Will Rise" which have been aired on the BBC, an extended band line-up of Nick (Vocals, Fiddle), Bryn (Vocals, Guitar), Martin (Vocals, Mandola), Gaz (Vocals Percussion) and Jon Dowling (Bass), and new for this album the swirling Irish flute and whistle of Jacquelyn Hynes. Special guests on the album also include the vocal and piano of Emi McDade and the fantastic earthy Accordion of Paul Hutchinson (of Belshazzars Feast). Engineered by Lyndon Webb, mastered by Daz Smith and being released on the bands own label Fiddle of 8 Records. It's a monumental album from start to finish. You can buy "We Will Rise" album through PayPal or by credit/debit card by clicking on the button below. The online price is £11 GBP which includes postage and packing within Europe. You will be asked to supply a shipping address when you place your order. Customers in the USA can also order online via cdbaby. The third FolkLaw studio album Smokey Joe is absolutely fantastic - featuring Nick, Bryn, Martin and Gaz - engineered by Lyndon Webb, mastered by Daz Smith and the first release to come out of the bands own label Fiddle of 8 Records. You can buy the Smokey Joe album through PayPal or by credit/debit card by clicking on the button below. The online price is £11 GBP which includes postage and packing within Europe. You will be asked to supply a shipping address when you place your order. Customers in the USA can also order online via cdbaby. The second FolkLaw studio album The Tales That They Tell comprises 10 of the very latest, greatest, FolkLaw songs including Seeds of Freedom, Leaves of Gold, Some way Somehow and of course The Tales That They Tell. It's a full band album, with Nick on Fiddle and vocals, Bryn on Guitars and BVs, Gaz and Marty on percussion and BVs, and Lyndon on mandolin and guitars. with fantastic songs, quality production and we love it! You can buy The Tales That They Tell album through PayPal or credit/debit card by clicking on the button below. Customers in the USA can also order online via cdbaby. You can buy the 3 best FolkLaws studio albums as a special package by clicking on the button below. The online price of £22 GBP which includes postage and packing within Europe. You will be asked for a shipping address when you place your order. The brand new live FolkLaw album recorded at Westonbirt Arboretum - Live at TreeFest - captures the spirit of the FolkLaw live show and comprises 10 cracking FolkLaw songs including some new additions such as Waterways of England, My Time, Cotswold Hills and Forever and a Day. Recorded and produced by Drew at MEMM and with massive thanks to Cello for his cover photography and the Forestry Commission and the 4014 project for putting on the gig. In keeping with TreeFest we've stuck to the environmental ethos on this one - eco-friendly card packaging and keeping down the CO2 emissions on the delivery miles. We love it! You can buy the Live at TreeFest album through PayPal or by credit/debit card by clicking on the button below. The online price is £6 GBP which includes postage and packing within Europe. You will be asked to supply a shipping address when you place your order. The debut lo-fi solo album which launched the FolkLaw project Nation's Pride comprises 11 of the very earliest FolkLaw songs with Guitar, Fiddle, Piano and Vocals by Nick and Gaz. Some classic long-standing FolkLaw favorites appear on this CD including Green Valleys which was a semi-finalist in the 2011 UK Song Writing Contest and runner-up in the Wessex Folk Festival 2011 song competition, The Star of Munster which was described as "Refreshingly Different" by Stirrings Magazine, and of course Nations Pride which has been played at over 250 gigs and was heralded as "Fantastic" by Stroud FM. There's some less well known FolkLaw songs on this CD too, and even the old ivories make an appearance on Ramshackle Road which we reckon is a corking track even though it's only ever been played live once, in the very early days during a musiclab session at Gloucester Guild Hall. Before you part with your hard-earned cash, bear in mind that this album came in for some stick in the music press for some poor recording quality! 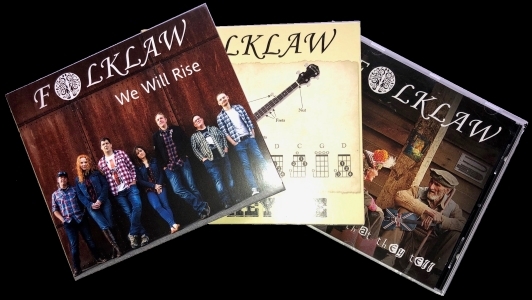 It's also a lot 'lighter' in touch than the later FolkLaw albums... ...but if you want to hear where the FolkLaw project all began, and complete the FolkLaw journey then this is the CD for you. You can buy the Nations Pride album through PayPal or by credit/debit card by clicking on the button below. The online price is £6 GBP which includes postage and packing within Europe. You will be asked to supply a shipping address when you place your order. Good for your bag, your jacket, your hat, and a few other places eh! There's always plenty of badges telling some tale of political protest on the FolkLaw jacket worn by Nick, so we thought it was about time we got some of our own! You can buy the FolkLaw set of 3 badges through PayPal or by credit/debit card by clicking on the button below. The online price is £3 GBP which includes postage and packing within Europe. You will be asked for a shipping address when you place your order. 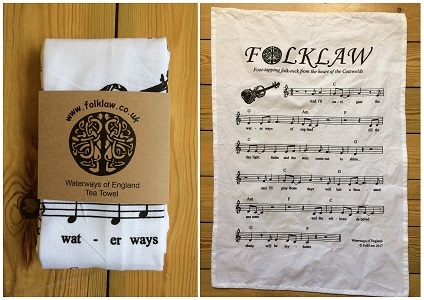 Bring some FolkLaw music into the kitchen with the beautifully crafted Waterways of England Tea Towel. In fact even better, why not sit down with your guitar and play out the song instead of washing up! This item will be back in stock again soon! Quality heavy cotton black t-shirt fronting an image of the FolkLaw fiddle and our fave quote from the Seeds of Freedom - "I'll be wherever my heart is free, and the seeds of freedom are carried on the breeze". Available in Medium, Large and Extra Large. To work out your size, measure the width or length of one of your favorite t-shirts at home and compare to the FolkLaw size guide below! 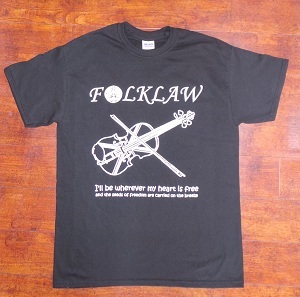 You can buy the FolkLaw T-shirt through PayPal or by credit/debit card by clicking on the button below. The online price is £10 GBP which includes postage and packing within Europe. You will be asked for a shipping address when you place your order. SOLD OUT!! The Waterways of England Mug Set (2013) - £Only available at gigs! 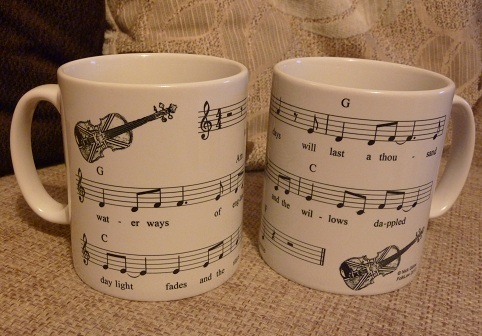 Two beautiful hand-printed mugs featuring music score and guitar chords for the well-loved FolkLaw song Waterways of England. We like to have our morning coffee in the first mug and our evening hot chocolate in the second one. The mugs are printed in near-by Herefordshire by our friend Kieth of Whitbourne Mugworks whose got a proper local cottage industry and we love'em. They're only available at gigs at the moment because we don't want to risk 'em in the post! and the willows dappled shade will be my home"
SOLD OUT!! The Limited Edition "Tales That They Tell" Mug Set (2013) - £Only available at gigs! A set of three hand-printed mugs featuring scenes from the Tales That They Tell animated folklaw single. You can see the full video here, but if you don't fancy being glued to youtube over breakfast then you can grab these little beauties and have a key frame with each cuppa! Mug 1. Standing outside Job Centre Plus, when the FolkLaw fiddle pops out of the case. Yipeee! Mug 3. The lads work their way up to a stadium gig! If all that sounds a bit energetic, you could always have a cup of tea in one. Top notch!